Yesterday afternoon HB228 came to the floor of the Ohio House for a vote. I prepared this video for you shortly after the floor action was over. As you know, Ohio Gun Owners worked with friendly gun rights organizations and legislators in the House to bring forward a strengthening amendment to make HB228 a rock-solid Stand-Your-Ground bill. Among many things, it would’ve achieved the hallmark objectives of Stand-Your-Ground law, like criminal and civil immunity from prosecution for innocent citizens, threatened use of force for deescalating violent situations, and more. In fact, the amendment by pro-gun champion Representatives Nino Vitale, Candice Keller, Paul Zeltwanger and Tom Brinkman was the most comprehensive self-defense reform amendment in Ohio history. As we suspected, however, a motion was made to adopt a technical amendment for the sole purpose of derailing our strengthening amendment. You see, politicians hate transparency. And because they hate transparency, they are always ready to deploy procedural tricks to make sure they’re rarely held responsible at election time by organizations like Ohio Gun Owners for their actions of killing pro-gun legislation. But we were prepared for their trickery, and once the opportunity presented itself, Representative Paul Zeltwanger ran a motion to refer the bill back to the Federalism Committee to have Stand-Your-Ground law reinserted back into the bill! 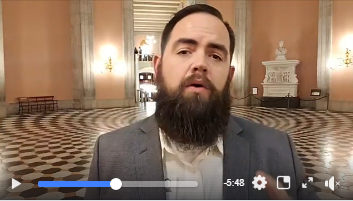 Caught unaware, his motion received a full vote and was voted down, but most importantly, Ohio Gun Owners now has a record, roll-call vote by many legislators against full-orbed Stand-Your-Ground law. This was an important achievement – and one that will pay dividends for gun owners for several election seasons to come! But now, as you’ll see in the video above, this fight goes to the Senate. We’ll keep you updated all along the way, but until then, stay active, stay mobilized, and stay informed. Not a member? Join Ohio Gun Owners today!